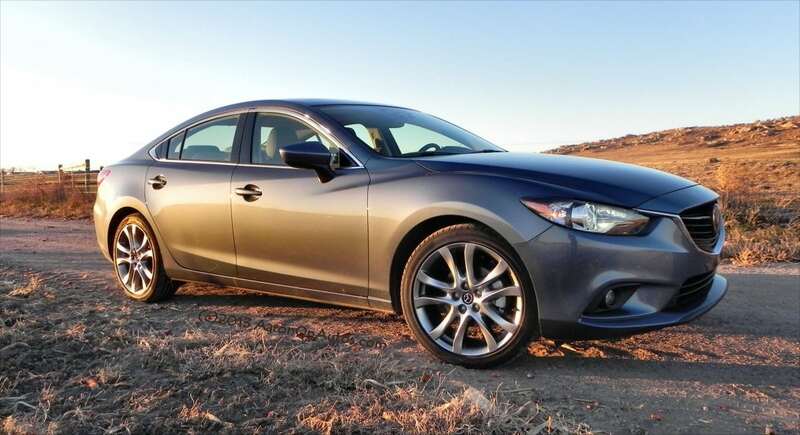 The 2014 Mazda6 is a complete redesign for the car and Mazda held nothing back. 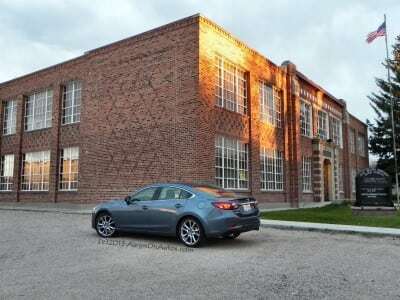 The exterior design is elegant, the interior design is comfortably refined, the driving dynamics are sporty, and the powertrain is more than efficient. In short, Mazda has created what may be the most well-designed vehicle in the midsize sedan class. The all-new 2014 Mazda6 was one of my first reviews here on CarNewsCafe as a first impression review of the car. 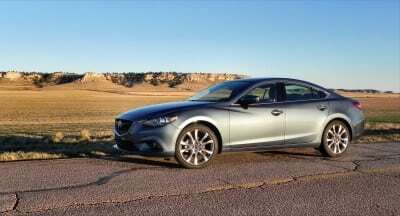 I was introduced to it at the Denver Auto Show 2013 and immediately knew I wanted to drive the car. 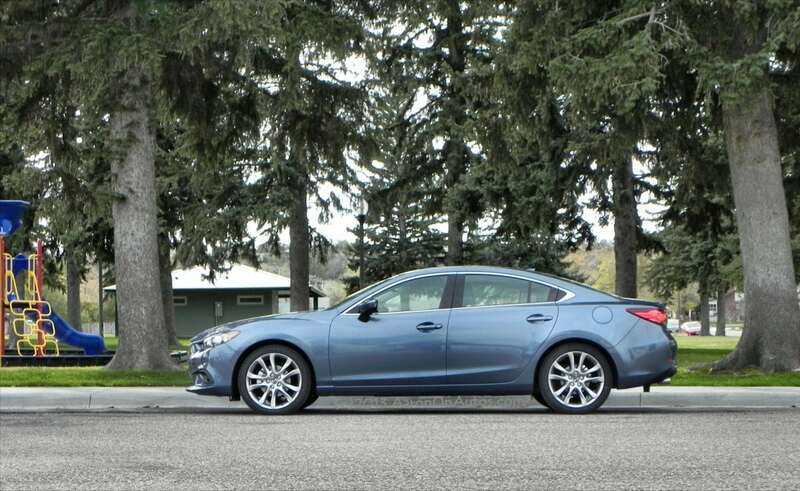 In today’s market, especially in the midsize sedan segment, competition is fierce. Very fierce. The Toyota Camry reigns supreme, but with 24 percent of the total car sales in the U.S. being at stake, no one in this segment is slacking off. Among that thick rivalry, only a few stand out as being exemplary in a crowd of exceptional offerings. This is one of them. 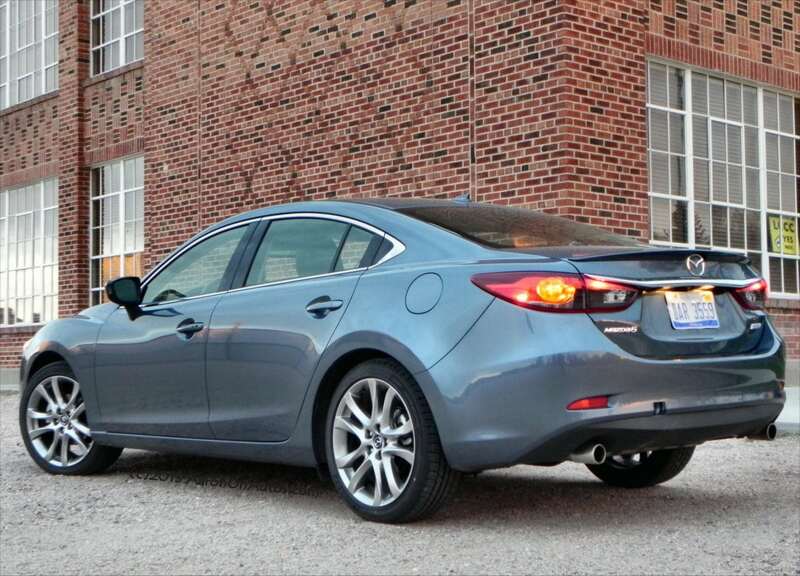 The 2014 Mazda6 looks good from every angle, but it really shines brightest in profile. The design is in three parts coming together into one vehicle. At the front, a low, clipped front fascia arches up in a sloping hoodline accentuated by a curved fender line whose arch ends at the front door seam. 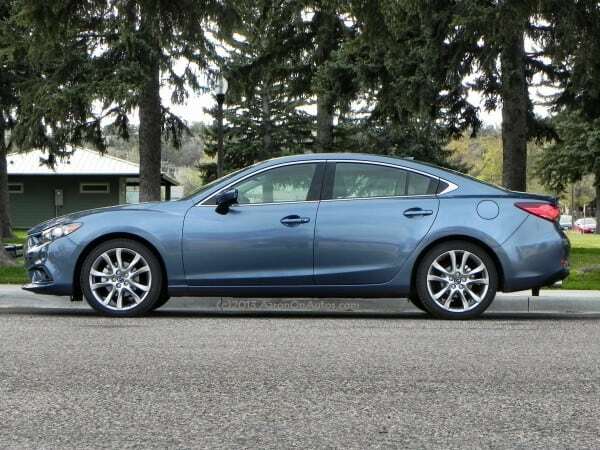 A low, coupe-like windscreen and roofline continue the sedan’s curves as jsut below it, along the door line, a slightly S-curved beltline flattens out at the rear door to continue across the rear fender to the trunk’s small spoiler. At the bottom of the doors, another slightly upward curving cut begins at the wheel well and runs across and up to the rear door seam. Black pillars and sharp European-style accents on the D-pillar at the rear completes the overall look. 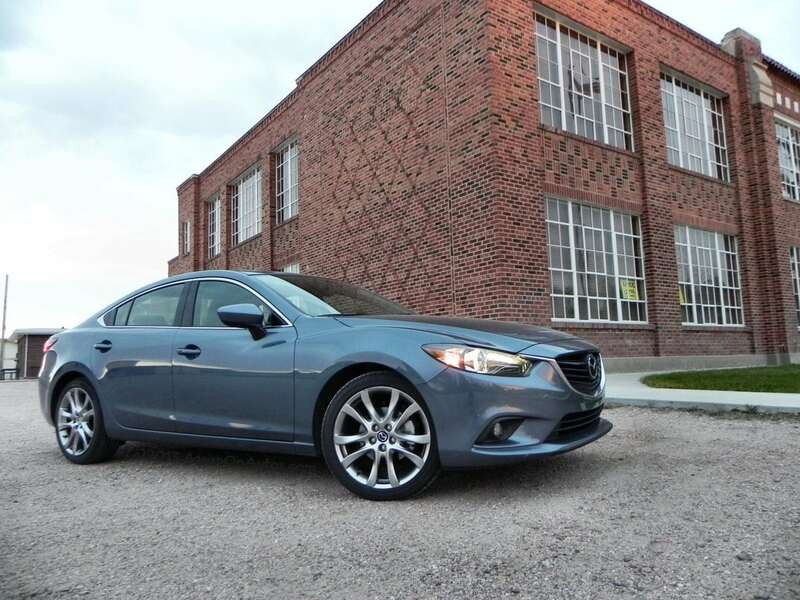 On the top-fit trim level package shown above, chrome accents and beautiful curved-V wheels complete the elegant look of the new Mazda6. 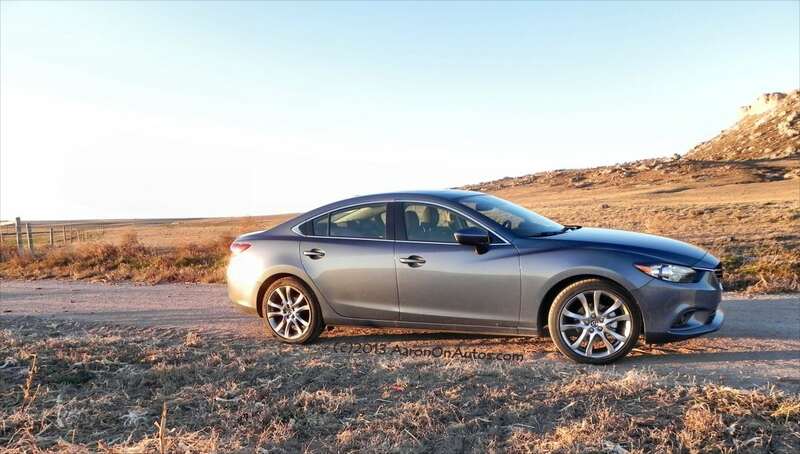 The 2014 Mazda6 has, so far, only one powertrain option: a 2.5-liter four-cylinder SKYACTIV engine that produces a powerful 184 horsepower and 185 lb-ft of torque thanks to its high-compression design. A six-speed manual or six-speed automatic transmission is available, with the automatic being standard on the Grand Touring package and the manual being standard on the lower-end Sport trim. 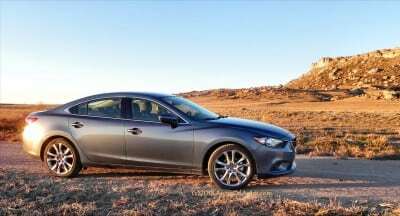 Zero to sixty times vary, but most news outlets are giving the Mazda6 a 7.5- to 8-second time, which is phenomenal for a four-cylinder. Our freeway onramp test achieved an easy 87 mph average, which is comparable to what was had in the 2013 Nissan Altima 3.5 with its V6. Impressive. Fuel economy is great in this package, achieving 38 mpg on the highway, according to the EPA. Our test vehicle included the new i-ELOOP mild hybrid technology which uses brake regeneration to capture electricity and take weight from the engine by occasionally relieving the alternator of its duties. 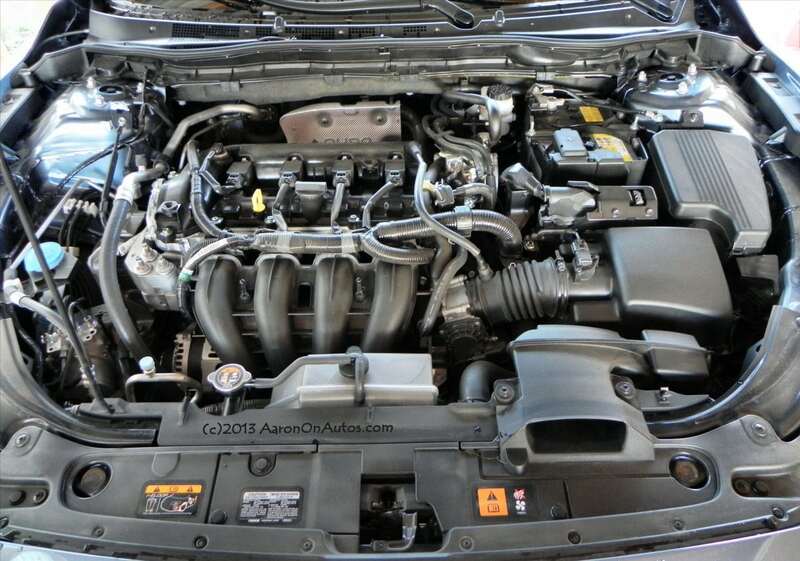 This plus the active grille shutters that come with that package upgrade boost fuel economy to a very impressive 40 mpg on the highway. 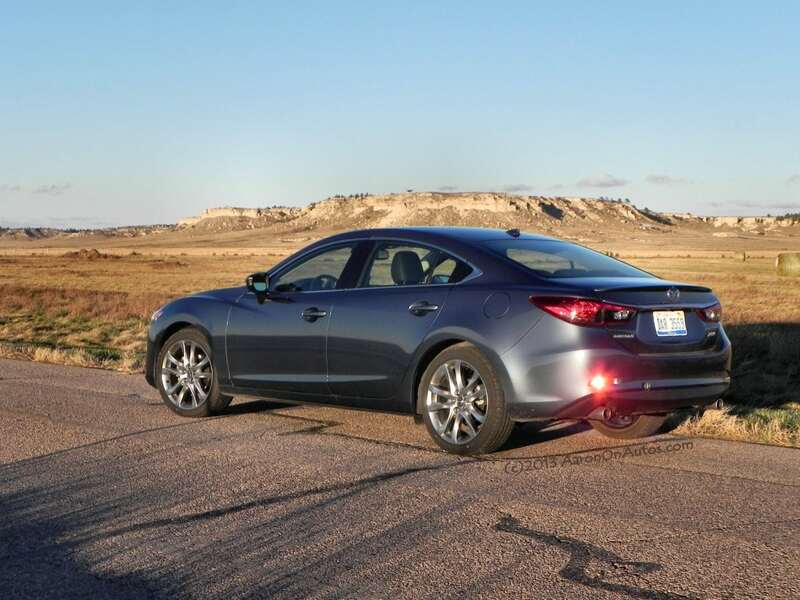 Our testing proved that this is not difficult to achieve either, though most drivers will likely fall a couple of MPG short of that mark in their everyday drive. A diesel engine has been promised for early next year, having been delayed due to some issues with the diesel’s reliability when it introduced in Japan. Mazda is remedying that and plans to bring it to the U.S. in the spring. 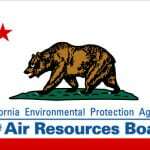 That 2.2-liter clean diesel will achieve in the 40-42 mpg range on the highway, most likely, but actual EPA numbers have not been released. 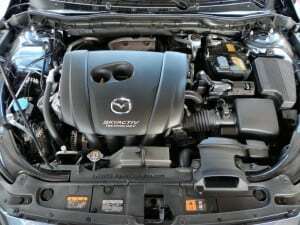 For such a small, quiet engine, the 2.5-liter SKYACTIV puts out a lot of get-up-and-go when you ask it to and the six-speed automatic transmission is so smooth you’ll swear it’s a CVT. It also doesn’t hesitate to drop a gear when you press the pedal for more output in order to get around that truck or accelerate when the speed limit jumps. 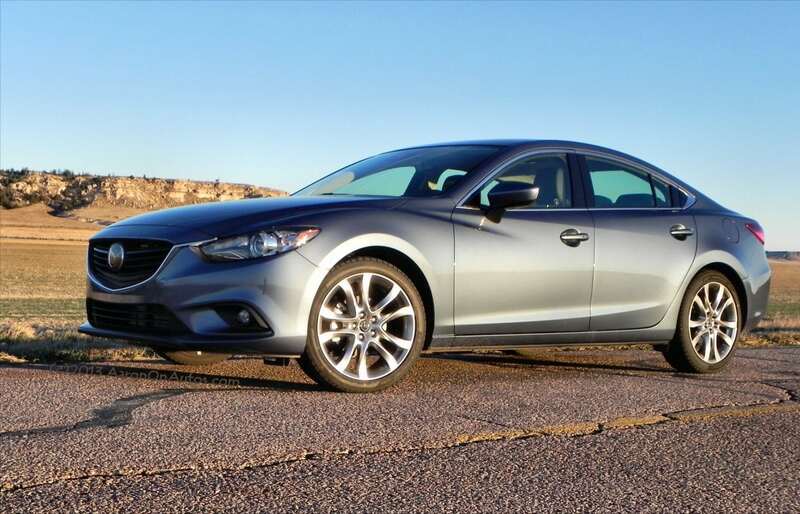 In handling, the SKYACTIV framework comes in again, delivering a responsive, fun experience (for a midsize sedan) that is likely unsurpassed in this class. 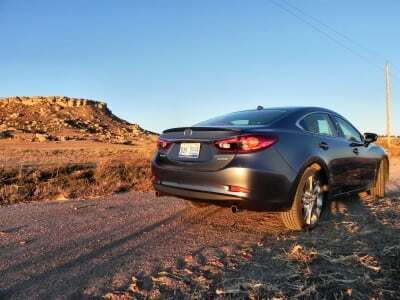 The car feels solid and stable, like a sports car, but doesn’t have the stiff ride or lack of give in the corners you normally get with one. It’s a great melding of comfort and sporty fun that is very unusual for a midsize family sedan. It is a rougher ride than some others, perhaps, but not overly so. Just enough to keep that Mazda Zoom Zoom feel the enthusiasts of the brand demand. Our model had the i-ELOOP regenerative braking system as well, which is so subtle that you’d never know it was there if it weren’t for the dashboard indicator. Paying close attention, we could feel it doing its thing slowing the car down when we touched the brake pedal, but it’s not obvious by any stretch. 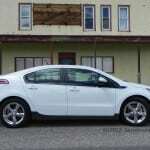 One thing that’s missing, which we think should be there, is a “brake” setting on the shifter like most hybrids have in order to create an engine braking scenario with the motor. This is a small thing, given the light nature of the mild hybrid system that i-ELOOP is, though, and probably a bit nit-picky on our part. 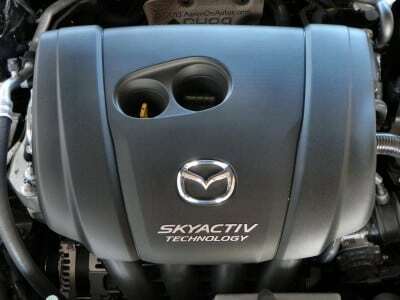 It’s hard to explain what SKYACTIV is without getting into a whole engineering dissertation about vehicle framing, body frames, chassis tuning, lightweigt materials use, and high compression gasoline engine technologies. To nutshell it all, Mazda has taken all of the available efficiency and safety technologies their engineers have accumulated over the years and put them into one system that builds a car top-to-bottom to emphasize safety, fuel economy, and driving dynamics. For the driver, that translates to a sporty feel, powerful engine output, excellent fuel economy, and top-tier safety in one vehicle package. The fact that, with the Mazda6, the engineers managed to couple all of that with a great-looking vehicle is just ala mode on the pie. 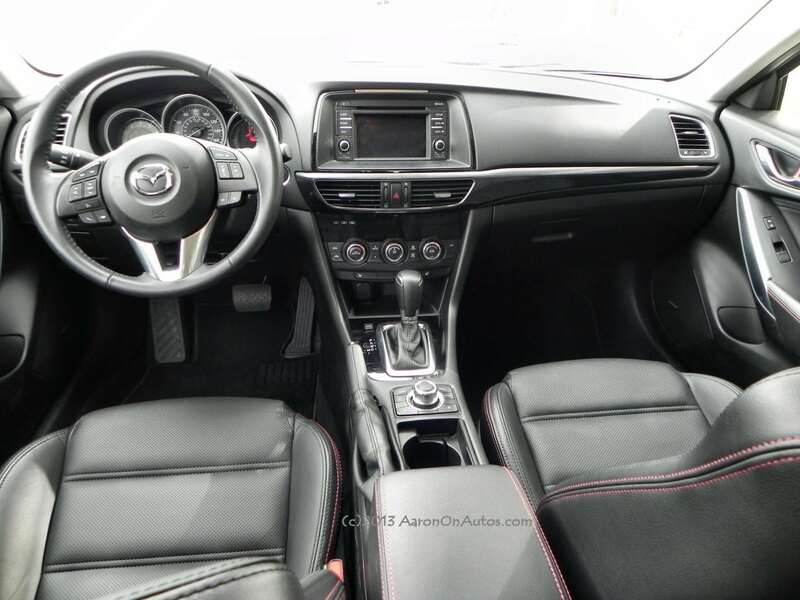 For the everyday driver, of course, the interior is far more important than is the exterior. 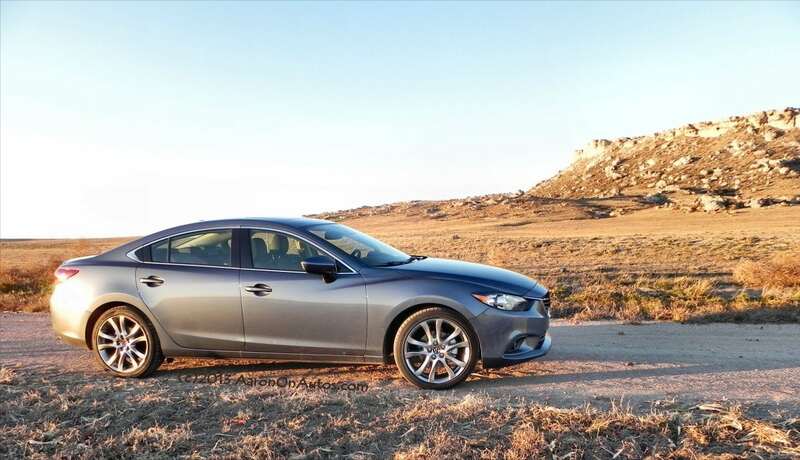 Inside, the 2014 Mazda6 is well-appointed at all trim levels. 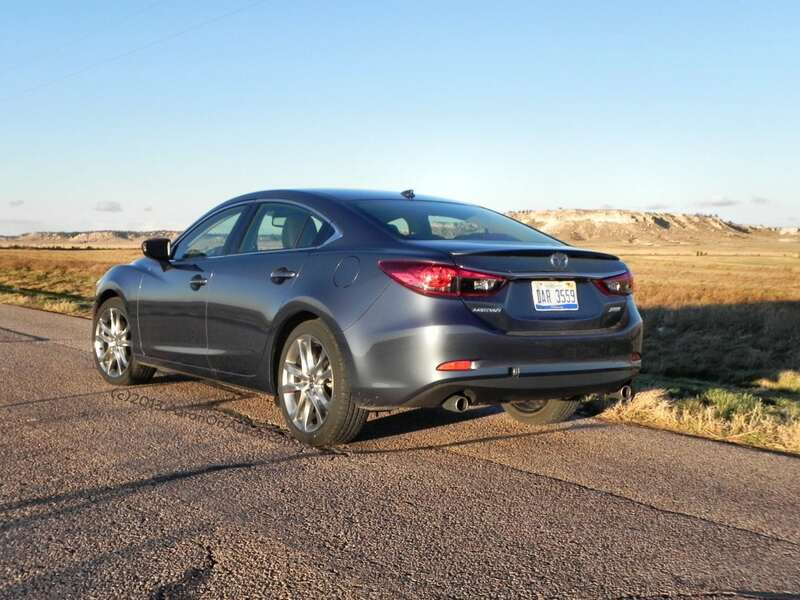 Earlier this year, I was able to drive a Touring model with the automatic transmission – the mid-level trim – and it was nicely done. Obviously, the high-trim Grand Touring driven for a week for this review was top notch. 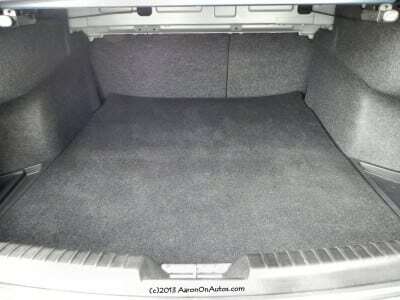 The front seats are sporty and comfortable; easy to get in and out of no matter your size. 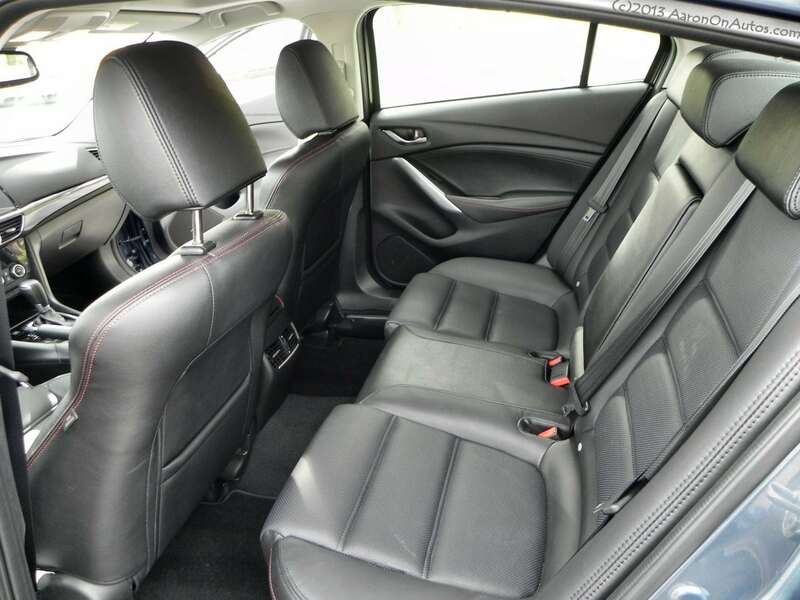 The rear seating is spacious and nicely done, though large people may find the knee room a little cramped if the driver is also tall. There is plenty of room on the back bench for three child safety seats to sit abreast. The cabin layout is well-considered, with good placement for most of the controls. 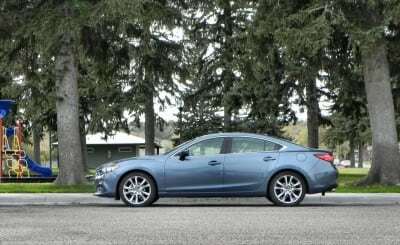 Some may find the infotainment system on the higher-end options to be a little clunky in comparison to some of the more refined offerings from others, but not overly so. Gauges are well-trimmed and easy to read, adjustments to seating and steering are good, and the nifty selection knob on the center console just behind the shifter seems goofy at first, but once you’ve used it to navigate the touch screen while driving, it makes perfect sense. 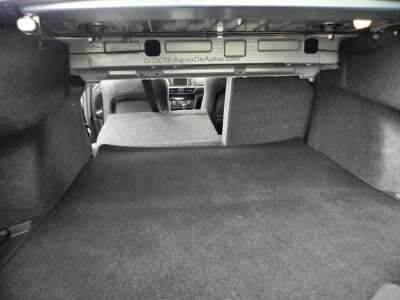 It saves the driver from having to lean forward to make selections on-screen, aiding both safety and comfort. All in all, the interior of the Mazda6 is well done without a cheap piece of plastic or wasted bit of space anywhere. The trunk is very large and matches the expectations most will have with today’s midsized sedans. 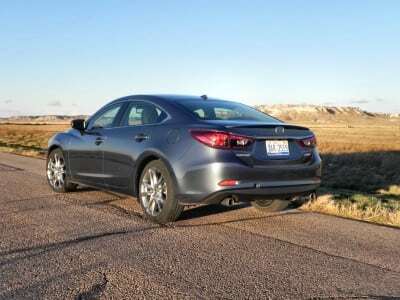 The key competitors for the Mazda6 are many, but are chiefly the Nissan Altima, Ford Fusion, and Kia Optima. 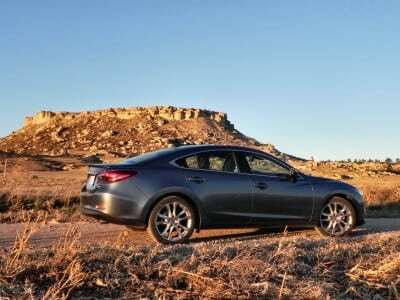 These are some tough rivals, of course, with the Altima offering the same or better driving dynamics than the Mazda6, the Ford being the Mazda’s chief rival in aesthetic style, and the Optima being the 6’s chief rival in price and interior refinement. Yet this should tell you something: the Mazda6 has all of those things at once, not individually. It’s a complete package. Very, very strong on style with a great look that rivals the rest of the segment, including the luxury market above this car’s price point. 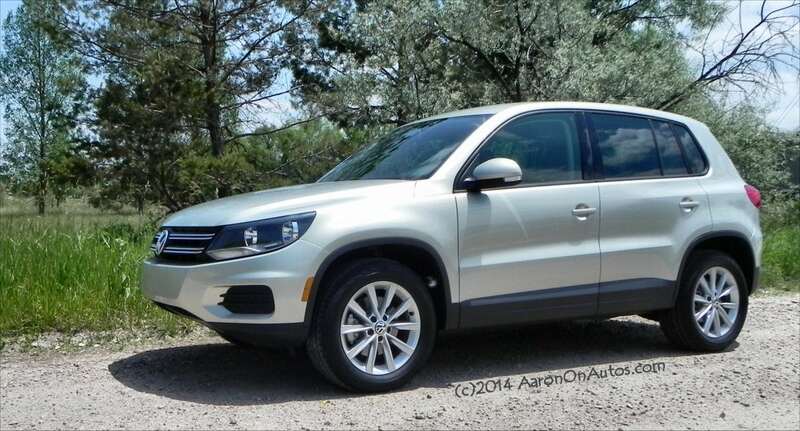 Exceedingly well-executed driving dynamics combined with excellent interior refinement in a fuel efficient package. Somewhat pricey in the higher-efficiency package. 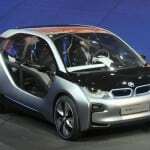 Limited powertrain options, reducing its competitive possibilities against rivals with a wider range of hybrid, plug-in, and other options. The 2014 6 is extremely stylish and very beautiful to both look at and drive. 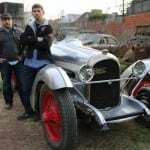 I was asked more than once “what kind of car is that?” by people who were convinced that it was a high-end luxury vehicle. 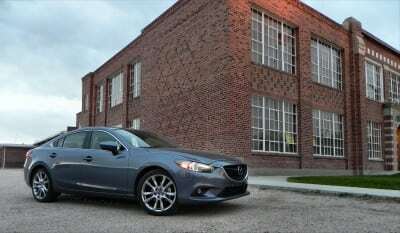 The only negative comments I had were from the die-hard Mazda haters, who immediately dismissed the car once they found out who made it – but, tellingly, not before they knew the make. That should say something. 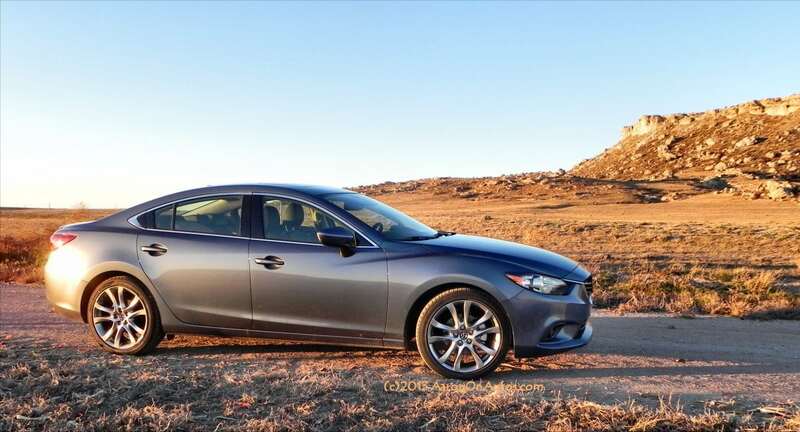 The 2014 Mazda6 is an elegant car with just about everything you could ask for in a midsize package. 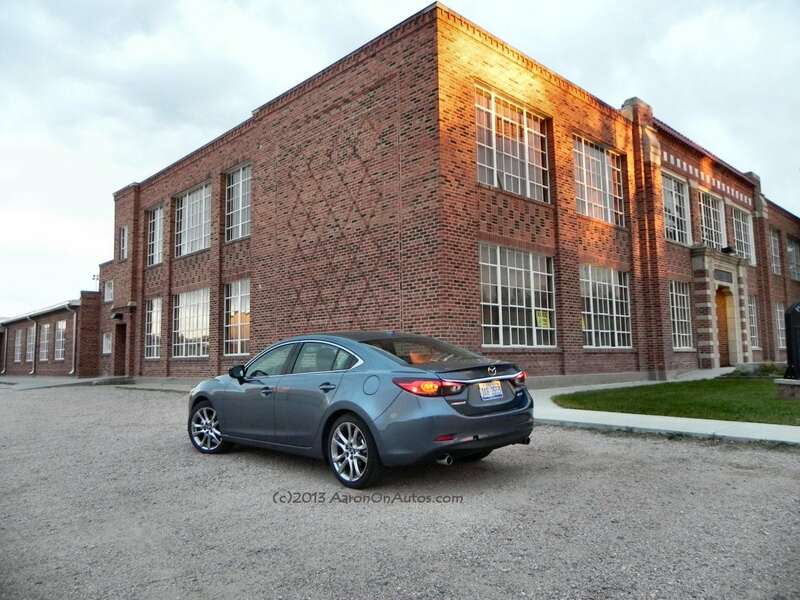 We drove the 2014 Mazda6 as a manufacturer’s press loan for about six days in Southeastern Wyoming. Our time in the car included highway, freeway, and city roads, driving with passengers, car seats, and more. 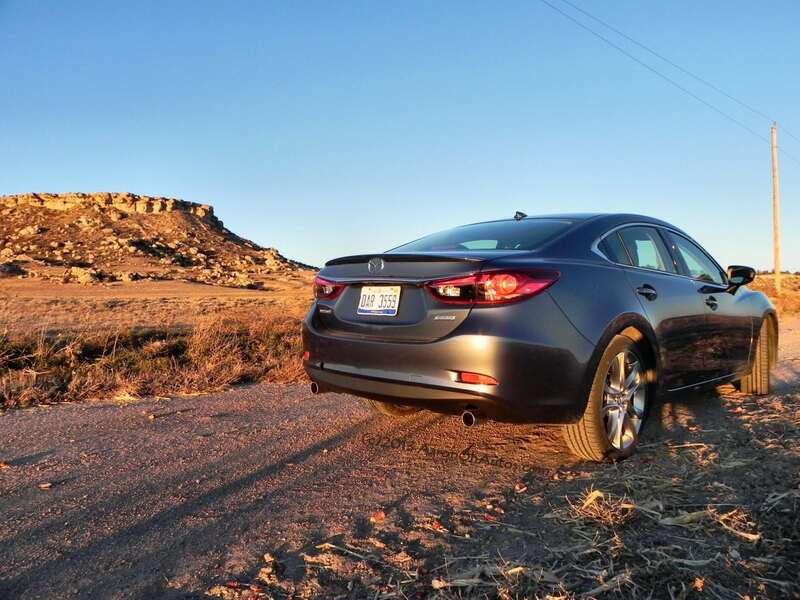 A total of about 300 miles were put on the car in that time.